Silver rounds are simply coins that take their name from the round shape of a coin. These coins possess no legal tender and are manufactured at private mints. Sold with lower dealer mark ups and premiums compared to all other coins, they make an excellent way to invest in this precious metal. Please read below to find 10 reasons why you should be investing in these bullion products. 1. Silver rounds are available in multitude of sizes ranging from one tenth of an ounce all the way up to a gigantic 100 oz size bullion coins. You can choose which size will better suit your investment needs. 2. 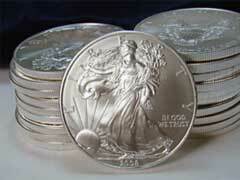 Unsurpassed .999 grade of silver they are made out to make them an ideal way to invest in silver. 3. Silver rounds are sold at significantly lower dealer premiums compared to silver numismatic coins and government issued bullions. 4. The value of silver rounds is directly tied to the silver bullion spot price creating an ideal safe haven from inflation. 5. These silver bullion coins are easy to buy from a variety of silver dealers and multiple silver bullion for sale online places. 6. Silver bullion investment coins are easy to store, transport and take virtually anywhere in case of events of catastrophic proportions. You can also easily re-sell them one by one given they come in many sizes. This is a great advantage compared to gold which may be harder to sell for a decent price when worst comes worst. Such coins are ideal for buying everyday necessities like food, medicine and shelter even in the worst situations. 7. Extreme liquidity driven by overall lower cost makes them one of the first in line of precious metal investment options. 8. Beautiful design of these coins makes investing fun due to endless varieties of them coming from all over the world. 9. Silver shortages are being predicted all over the world making silver rounds one of the most desirable forms of investment. 10. Incredible growth potential of the metal over the next couple of years place these choices on top of the list for most precious metals investors. If the reasons described here have not convinced you to invest in precious metals, please know that the natural reserves of silver are diminishing at staggering rates annually which will inadvertently result in sky rocketing prices on this precious metal in not so distant future.